Say you’re looking for a new dishwasher. Before the web, you might have picked up a copy of Consumer Reports. Or you might have asked friends or neighbors if they were happy with a particular brand. Unlike the physics example, in this case people you know might actually be good authoritative sources. 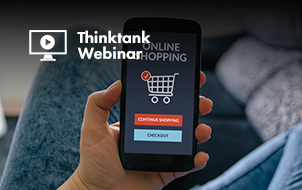 As soon as it was apparent that the World Wide Web was going to become the major repository for human knowledge – not to mention the primary source for products, services, entertainment, and much else – the need for search engines was obvious. 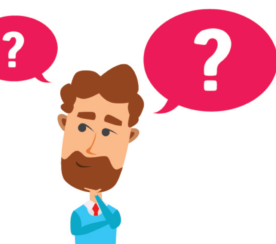 Search engines help connect us with authoritative sources for our questions and needs, whether that’s a physics professor’s blog or dishwasher reviews by real users. There were a few early attempts to do human indexing and categorization of webpages, but it didn’t take long to realize that effort would never keep up with the growth of the web. Modern search engines use complex algorithms to find, read, and ascertain the topicality of webpages. They can then match those pages with search queries looking for the information they contain. In other words, search engines are trying to find the most authoritative (and relevant) sources to match the query. For any given query, there are typically a great many pages that potentially satisfy that query. Users expect the search engine to take the role of the knowledgeable librarian and direct them to the best pages for the query. 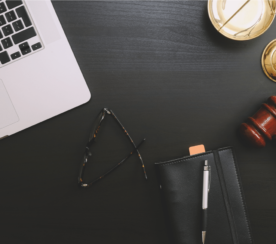 That’s a judgment, then, of the relative authority for the topic of the query of all the possible pages, so search engines must be able to assess that relevance and authority at a huge scale. First, a search engine must read and analyze the actual content and other features on a page. From this, the engine associates relevant topics with the page. In the early days, on-page assessment pretty much ended there, but now search engines are much more sophisticated in being able to analyze a page’s language, structure and other features to determine things like how completely the page addresses a topic and how useful it might be to a visitor. Once the search engine understands the page and adds it to its index, it turns next to external signals that help validate and gauge the level of authority of the page for any given topic. Ever since the invention of PageRank by Google founders Larry Page and Sergey Brin, links have been the primary signal used for such assessment. Search engines use links much like we might treat scholarly citations. The more scholarly papers relevant to a source document that cite it, the better. The relative authority and trustworthiness of each of the citing source comes into play as well. In the next two sections, we will go into more depth about how search engines use content and links to assess authority, as well as what you need to do to gain such authority for your own site. The essential insight behind this paper was that the web is built on the notion of documents inter-connected with each other via links. Since putting a link on your site to a third-party site might cause a user to leave your site, there was little incentive for a publisher to link to another site, unless it was really good and of great value to their site’s users. In other words, linking to a third-party site acts a bit like a “vote” for it, and each vote could be considered an endorsement, endorsing the page the link points as one of the best resources on the web for a given topic. Then, in principle, the more votes you get, the better and the more authoritative a search engine would consider you to be, and you should therefore rank higher. A significant piece of the initial Google algorithm was based on the concept of PageRank, a system for evaluating which pages are the most important based on scoring the links they receive. So a page that has large quantities of valuable links pointing to it will have a higher PageRank, and in principle will be likely to rank higher in the search results than other pages without as high a PageRank score. When a page links to another page, it passes a portion of its PageRank to the page it links to. Thus, pages accumulate more PageRank based on the number and quality of links they receive. So more votes are better, right? Well, that’s true in theory, but it’s a lot more complicated than that. PageRank scores range from a base value of 1 to values that likely exceed trillions. 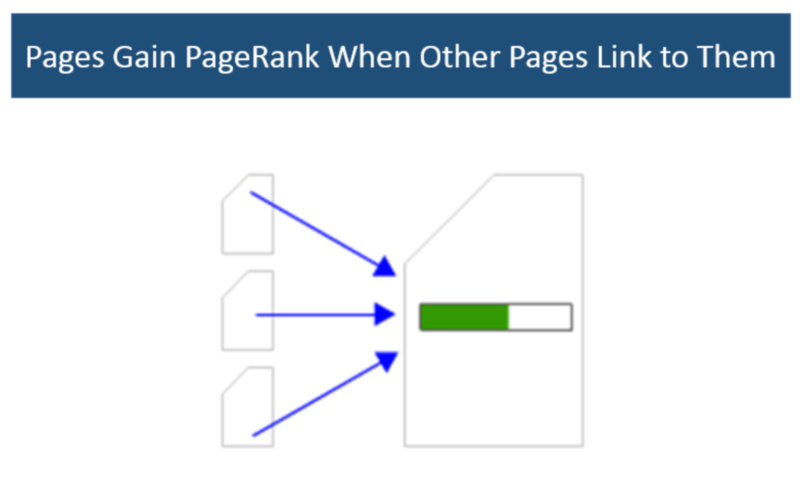 Higher PageRank pages can have a lot more PageRank to pass than lower PageRank pages. In fact, a link from one page can easily be worth more than one million times a link from another page. Let’s use our intuition for a moment. Imagine you have a page that’s selling a book, and it gets two links. One is from Joe’s Book Store, and the other one is from Amazon. It’s pretty obvious which one you would value more as a user, right? As users, we recognize that Amazon has more authority on this topic. As it turns out, the web has recognized this as well, and Amazon has a much more powerful link profile (and higher PageRank) than any other site involved in selling books. As a result, it has much higher PageRank, and can pass more PageRank to the pages that it links to. It’s important to note that Google’s algorithms have evolved a long way from the original PageRank thesis. The way that links are evaluated has changed in significant ways – some of which we know, and some of which we don’t. We’ll discuss the role of relevance in the next section. You have to be relevant to a given topic. If you have a page about Tupperware, it doesn’t matter how many links you get – you’ll never rank for queries related to used cars. This defines a limitation on the power of links as a ranking factor, and it shows how relevance also impacts the value of a link. Consider a page on a site that is selling a used Ford Mustang. Imagine that it gets a link from Car and Driver magazine. That link is highly relevant. Also, think of this intuitively. Is it likely that Car and Driver magazine has some expertise related to Ford Mustangs? Of course, they do. In contrast, imagine a link to that Ford Mustang from a site that usually writes about sports. Is the link still helpful? Probably, but not as helpful, because there is less evidence to Google that the sports site has a lot of knowledge about used Ford Mustangs. 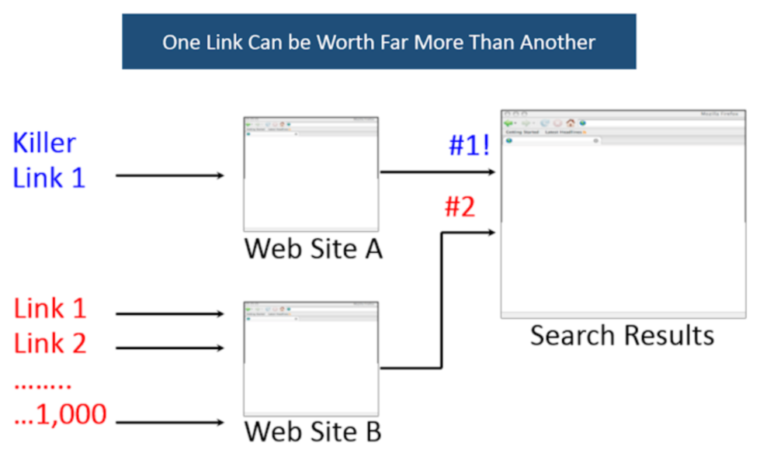 In short, the relevance of the linking page, and the linking site, impacts how valuable a link might be considered. Domain Authority and Page Authority from Moz. Citation Flow and Trust Flow from Majestic. Domain Rank and URL Rank from Ahrefs. Each of these metrics does a good job of helping you evaluate the merits of a page and offering a working estimate for how much PageRank it has to pass. Still, you should understand that these are only back-engineered estimates of how authoritative Google sees the domain or page, and not actual representations of PageRank. It’s also important to be aware that none of these tools provide a complete picture of all links on the web. Unlike Google, these tools do not have the infrastructure required to crawl the entire web, so they instead focus on discovering a significant sample of the links to a given site or page. 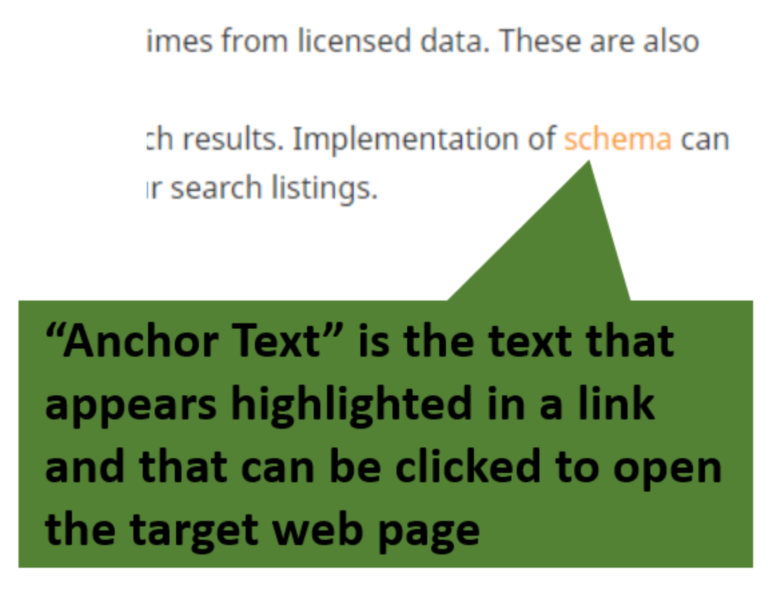 Anchor text is another aspect of links that matters to Google. The anchor text helps Google confirm what the content on the page receiving the link is about. For example, if the anchor text is the phrase “iron bathtubs” and the page has content on that topic, the anchor text plus the link acts as further confirmation that the page is about that topic. Thus the links act to evaluate both the relevance and authority of the page. Be careful, though, as you don’t want to go aggressively obtaining links to your page that all use your main key phrase as the anchor text. Google also looks for signs that you are manually manipulating links for SEO purposes. One of the simplest indicators is if your anchor text looks manually manipulated. You may hear many people talk about the role of trust in search rankings and in evaluating link quality. For the record, Google says they don’t have a concept of trust they apply to links (or ranking), so you should take those discussions with many grains of salt. These discussions began because of a Yahoo patent on the concept of TrustRank. 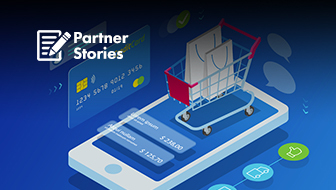 The idea was that if you started with a seed set of hand-picked, highly trusted sites, and you then counted the number of clicks it took you to go from those sites to yours, the fewer clicks the more trusted your site was. Google has long said they don’t use this type of metric. However, in April 2018, Google was granted a patent related to evaluating the trustworthiness of links. But the existence of a granted patent does not mean it’s used in practice. For your own purposes, however, if you want to assess the trustworthiness of a site as a source of a link, using the trusted links concept is not a bad idea. Have less than great content. Google may not be calculating trust the way you do in your analysis, but chances are good that some other aspect of their system will devalue that link anyway. Now that you know that obtaining links to your site is critical to SEO success, it’s time to start putting together a plan to get some. The key to success is understanding that Google wants this entire process to be holistic. Buying links for SEO purposes. Going to forums and blogs and adding comments with links back to your site. Hacking people’s sites and injecting links into their content. Distributing poor quality infographics or widgets that include links back to your pages. Offering discount codes or affiliate programs as a way to get links. And, many other schemes where the resulting links are artificial in nature. What Google really wants is for you to make a fantastic website, and promote it effectively, with the result that you earn or attract links. The first key insight is to understand who it is that might link to content that you create. Who do you think are the people that might implement links? It’s certainly not the laggards, and it’s also not the early or late majority. It’s the innovators and early adopters. These are the people who write on media sites, or have blogs, and who might add links to your site. There are also other sources of links, such as locally-oriented sites, such as the local chamber of commerce or local newspapers. You might also find some opportunities with colleges and universities if they have pages that relate to some of the things you’re doing in your market space. Now that we know who the potential linkers are, the next step is to create content to which they want to link. It’s pretty easy for them to find better content than yours on the web, if it exists. The best way to cope with that reality is to create expert content. If you can do this, your chances of getting people to link to you go way up. People want to be part of sharing expert content with their friends and their followers online. And, if they write on a media site or on a blog, some of them will want to write about it as well. If you want this to have a huge impact on your SEO, then start thinking about creating “Elite Content” or “10X Content” (i.e., content that is 10 times better than anything else ever published on the topic before). 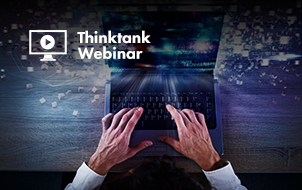 This is content that causes you to be seen as a thought leader, and it’s the best type of content to create to boost your online reputation, visibility, and SEO. This all sounds good, but it’s not enough to publish great stuff. If people don’t trust you, or if they’re not willing to take a chance on you, progress will be much slower. It’s important to realize that any given marketplace represents an ecosystem. If you’re seen as only looking out for yourself, people will be slow to support you. Instead, find ways to work the ecosystem. Help others out on social media. Respond to comments in your social media feeds, and on posts that you publish online. Go to conferences and make completely non-commercial presentations that inform the audience on topics of interest in your market. Go to local events and share advice and counsel. Become an active and contributing member of the community (that forms your marketplace), and actively share the smart advice and contributions of others. If you share and link to great content that others publish, the chances that they will share and link to your content goes way up. Publishing content on third-party sites (a.k.a., guest blogging) can be a smart thing to do, too. Consider trying to get a column on a major media site that covers your market niche. This will certainly contribute to your reputation as an expert and help with your reputation and visibility. Also, most media sites will give you an attribution link at the bottom of each article, or they’ll give you an author bio page that links back to you as well. These types of bylined articles can be invaluable in driving SEO benefits. Be careful, though, to focus on the high end of potential target sites. If 100 sites cover your market, then there are no more than 20, possibly 30 targets, that will do, and it’s the top 20 or 30 sites in your space. Ah yes, we’re back to your ability to create expert content again! If you’re able to leverage a strong social media presence, you can expose your content to a large number of people. However, this depends on your building a positive image with that audience. If you do that through positive interactions with your community, including the pre-existing influencers in the community, you have a strong chance of netting good results. Obtaining good results from social media depends on creating the right types of content. 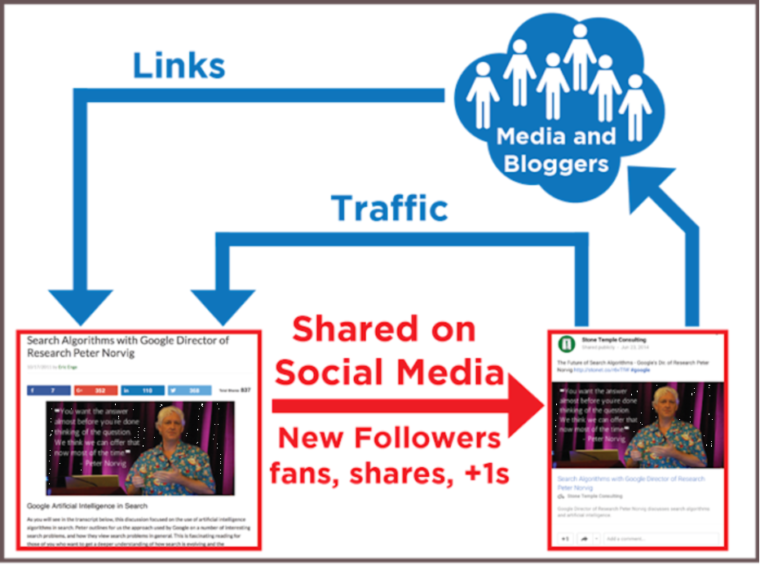 A study by Moz and BuzzSumo analyzed 1 million articles to try to determine the correlation between shares and links. This study showed that across the complete article set, there was almost no correlation at all. However, a deeper analysis showed that certain types of content performed far better. 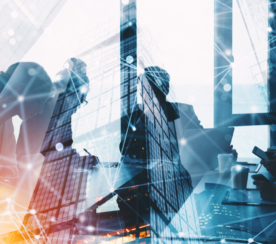 In particular, opinion-forming journalism from recognized experts, and data-driven research studies showed a strong correlation between shares and links. This ties in well with the idea of writing content for innovators and early adopters and recognizing this should be a cornerstone of your overall link-earning/attraction strategy. Once you have established this position in the market, the role of social media becomes easy. You use it to create exposure to great new content, and the rest takes care of itself! It is highly unlikely that any major search engines use links in social media posts as an authority signal. They realize that links from social media posts are nowhere near as clear a signal as links from regular websites. Also, most major social media platforms use a nofollow attribute on outbound links, which tells search engines not to pass any PageRank through the link. Make use of social media to build your personal and brand authority and trust and to build relationships with relevant influencers, both of which can lead to more opportunities to earn links. 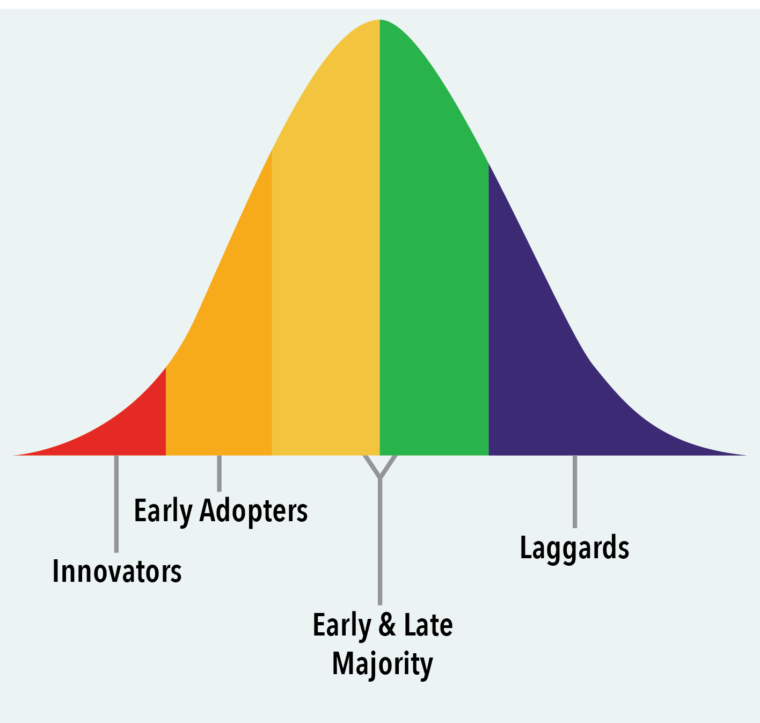 Earlier, we spoke about the role of innovators and early adopters. Another term people use for these two groups of people is influencers, because others (including your potential customers) are influenced by them. 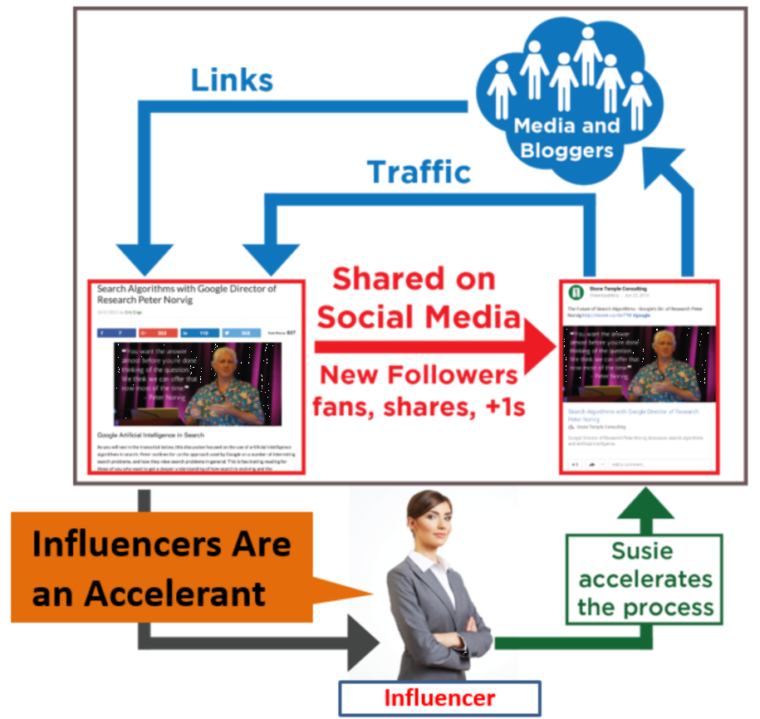 So social media can help provide visibility for your content, and potentially result in links, but this goes even faster if influencers are involved in sharing your content. Once that starts happening, the growth of your reputation, visibility, and links will accelerate. The trust and relationships you build with them. Your willingness to share/link to their stuff. The quality of the content you create. Last, but certainly not least, create a real plan for your content marketing. Don’t just suddenly start doing a lot of random stuff. Take the time to study what your competitors are doing so you can invest your content marketing efforts in a way that’s likely to provide a solid ROI. One approach to doing that is to pull their backlink profiles using Link Explorer, Majestic, and Ahrefs. With this information, you can see what types of links they’ve been getting and then based on that figure out what links you need to get to beat them. Take the time to do this exercise and also to map which links are going to which pages on the competitors’ sites, as well as what each of those pages rank for. Building out this kind of detailed view will help you scope out your plan of attack and give you some understanding of what keywords you might be able to rank for. In addition, study the competitor’s content plans. Learn what they are doing and carefully consider what you can do that’s different. Focus on developing a very clear differentiation in your content for topics that are in high demand with your potential customers. This is another investment of time that will be very well spent. In a Google Hangout sponsored, Google engineer Andrey Lipattsev was asked what the top ranking factors are for Google. He replied that the top two were links and content (but not necessarily in that order). It’s easy to misunderstand that statement (in reality both links and content are probably made up of and influenced by a great many particular factors), but the import of the statement is clear: To do well with search engines, you must have high-quality content and authoritative, relevant links. Remember where we began this chapter: Search is the quest for authority. Search engines want happy users who will come back to them again and again when they have a question or need. The way they create and sustain that happiness is by providing the best possible results that satisfy that question or need. To keep their users happy, search engines must be able to understand and measure the relative authority of webpages for the topics they cover. When you create content that is highly useful (or engaging or entertaining) to visitors – and when those visitors find your content reliable enough that they would willingly return again to your site, or even seek you out above others – you’ve gained authority. The search engines work hard at continually improving their ability to match that human quest for trustworthy authority. As we explained above, that same kind of quality content is key to earning the kinds of links that assure the search engines you should rank highly for relevant searches. That can be either content on your site that others want to link to or content that other quality, relevant sites want to publish, with appropriate links back to your site. Build relationships (especially with influencers). Increase the reputation of your brand. 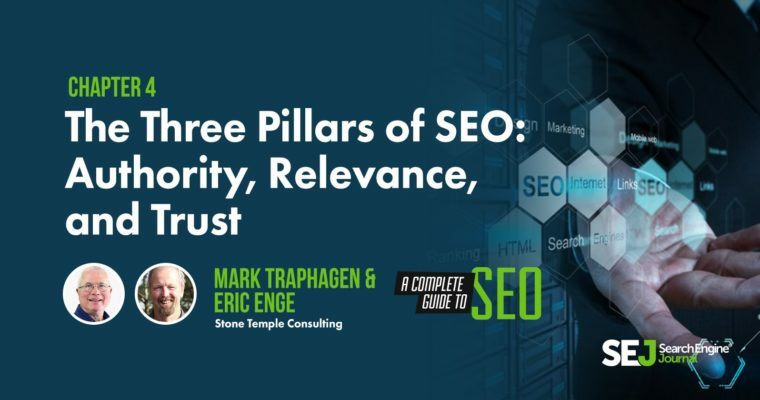 Focusing on these three pillars of SEO – authority, relevance, and trust – will increase the opportunities for your content and make link-earning easier. 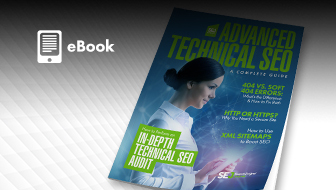 You now have everything you need to know for SEO success. So get to work!